Michael Caine is one of those actors I have accidentally overlooked here in the Blog House, ahem, I mean the Ginger Twilight Zone. Sure, he rose back to prominence for today's audience thanks Christopher Nolan's Batman movies, but the argument could be made that the man never fell out of prominence. Not entirely, anyway. Perhaps the closest he came to that point was the early 80's when he made such flops as Beyond the Poseidon Adventure and The Island. Those certainly weren't the last flops he ever made, but that is probably when he was the most generous with them. 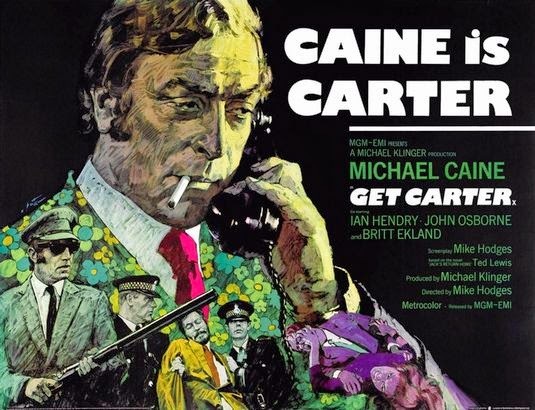 Get Carter was from Michael Caine's pre-flop era and it is far superior than the remake that starred Sylvester Stallone and even featured Caine in a supporting role. This is a film that I hope a lot of young people will discover after having seen all of the newer Batman films, Inception, and The Prestige. Because, while all of those movies are quite good, they don't quite have that distinct British flavor that best represents Michael Caine. Of course, I know how bizarre it is to say that since Christopher Nolan was born in London, but Nolan never tried to direct a British movie. Outside of Following, that is. Get Carter is a British movie through and through and the main character is a real cold fish and thoroughly unlikeable. At least, he is unlikeable to those that don't appreciate the quiet badass murderer types. It's no surprise that this movie didn't make any real money in the UK when it was released or even make the crossover to the US. Aside from Caine, this movie had no real bankable star that either the US or even the UK would recognize. The US, in particular. Telly Savalas was the popular name that studios tried to sell director Mike Hodges, but Hodges stuck to his guns and made the movie using an all Brit cast. Later on Telly Savalas and Caine would be in Beyond the Poseidon Adventure together, but I don't think that was quite the result anyone was hoping for. While Mike Hodges wouldn't go on to make many other sound decisions in his directing career, I think the planets just aligned for him when he made this film. This film shouldn't have worked, but it is now considered a masterpiece of the British crime genre as well as of British cinema in general. Most of this is due to Michael Caine's presence and contribution to minute changes of the script, but I think the ending is what seals the deal. It's bold and daring and practically everything that the Sylvester Stallone version isn't. If there's a movie that should be on anyone's bucket list then this version of Jack Carter's quest for vengeance is it. Michael Caine is a favorite of mine and I have never seen this movie, so I will check it out. Michael Caine has been in so many movies that he was part of a great Dennis Miller joke. Dennis Miller (back when he was regularly doing stand-up) said, "I was watching the video of my friend's wedding the other day and dammit if Michael Caine wasn't in it!"